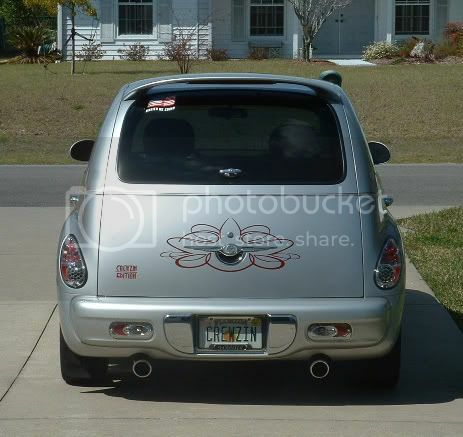 people who have this done to their cruiser: if i wanted to put an exhaust system with dual tips on my cruiser, would i be able to simply make a second cutout for the second tip, or would i need to buy a whole new rear bumper with the cutouts for dual outlet already in it? You can cut the rear fascia quite easy. The way I did it was to put the dual exhaust up just temporarily so you can see exactly where you need the cut-out. I traced the original cut-out on the left side with a piece of paper, then put that paper on the right side and marked exactly where I need to cut. Took tin snips and cut just inside the traced marks on the right side and then used a small saw and file to get the exact outline as perfect as I could to the mark. It's all plastic, and Tin snips (metal shears) work great. I also touched up with a half-round file. I had a question about dual exhaust. I dont have my spare tire and I was looking at the best and cheapest option for duals and exhaust cutouts. I want to keep it with no muffler but the drone in the cab is kinda annoying. Is there anyway to just reduce drone and also how would it sound just split off with no muffler. I also wanted it to sound the best possible so if a muffler is the way to go I will. Also what size pipe what make the best sound. I would like to keep original size but if have to upgrade to 3" thats ok also. Forums : Aftermarket : Dual exhaust?